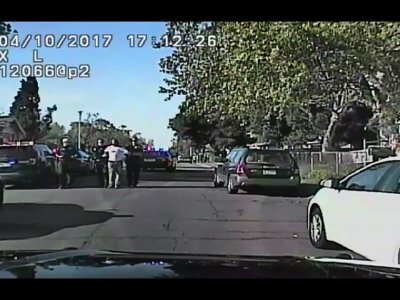 SACRAMENTO, Calif. (AP) — A black man hurled to the ground and punched repeatedly in the face by a police officer this month has filed a federal civil rights lawsuit against the city and county of Sacramento, claiming Monday he was targeted because of his race and abused in jail after his arrest. The lawsuit seeking unspecified monetary damages for Nandi Cain, who police said was jaywalking, also named the officer as a plaintiff and identified him as Anthony Figueroa, said Cain’s lawyer, John Burris. Cain told reporters that his memory of the event is blurry because he suffered a concussion and could barely see because of a black eye and that his nose was broken. Burris said Cain was guilty mainly of “walking while black” and that the incident reminded him of the videotaped beating of black motorist Rodney King in Los Angeles. Four white police officers were acquitted in King’s beating 25 years ago, sparking days of deadly rioting. Police who had criticized the officer’s actions during the widely publicized April 10 event captured on video had not identified him, saying only that the officer was a two-year member of the force placed on unpaid administrative leave. Officer Matthew McPhail, a department spokesman, said the department wasn’t commenting because of the pending lawsuit. Figueroa also did not immediately respond to an emailed request for comment about the lawsuit or the April 10 incident, which officials have said happened when Cain was told by the officer to stop because he had jaywalked on a residential street in California’s state capital. McPhail and Cain’s attorneys said they did not know the race or ethnicity of the arresting officer. Cain, 24, refused and challenged the officer to a fight, officials have said. The officer then lunged at Cain and tackled him, punching him repeatedly, according to the video released by the police department. Video of the confrontation filmed by a bystander went viral and generated outrage across the U.S.
Cain was handcuffed for suspicion of resisting arrest and an outstanding misdemeanor arrest warrant, authorities have said. Police said he continued resisting by kicking the interior of a patrol car and was restrained with a leg hobble. After being brought to a jail, Cain was repeatedly kneed in the ribs by corrections officers who also used their knees to pin him down while stripping off his clothes, said the federal lawsuit filed Sunday in Sacramento. “I’ve been embarrassed and discriminated against when all I’ve been trying to do is go home from work,” Cain told reporters. Cain cried out in pain while he was naked on the floor of the jail and was mocked by the corrections officers, the lawsuit said. It said he was left alone in a cell without medical attention, food or the ability to make a phone call. Cain was released from jail after nine hours and no charges were filed against him. Since then, Cain said he has been depressed with nightmares and cold sweats and unable to sleep or eat regularly. He said he is still receiving medical treatment for the concussion. Cain speculated that he might still be in jail if a bystander had not initially posted video of the confrontation. “Racism is still alive, and you would think, it’s 2017 that it would die, but it still exists,” Cain said, adding that he had been racially targeted before but that this event marked the first time it was captured in images. The police department and Sacramento Mayor Darrell Steinberg have previously called the officer’s behavior disturbing and unreasonable. Burris contested the allegation that his client was jaywalking. “But jaywalking in and of itself does not and should not ever result in a person being beaten about his face and head without a justification for it,” he said.